PR Special Fasig-Tipton Saratoga Selected Yearlings: What’s In A (Stakes) Name? In this edition of the PR Special, features editor Natalie Voss examines some of the famous names on the Saratoga stakes schedule – and introduces us to some of the people, horses and places from which they are derived. 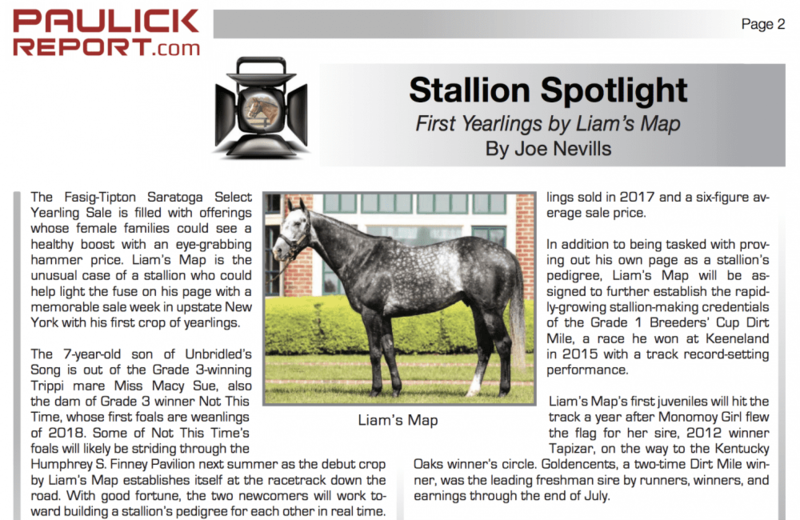 In the Stallion Spotlight feature, bloodstock editor Joe Nevills takes a look at Liam's Map, one of several highly regarded first-crop sires with yearlings selling at Saratoga, and, in the Honor Roll, racing editor Chelsea Hackbarth provides details behind agent Mike Ryan's purchase at the 2016 Saratoga Sale of Rushing Fall, who would go on to win the G1 Breeders' Cup Juvenile Fillies Turf. In addition to Nevills' Five to Watch – a look at some of the sale's top hips – veterinarian Kathleen Paasch, in Rood and Riddle's Ask Your Veterinarian, examines advantages and disadvantages of swimming yearlings as preparation for auction. This entry was posted in PR Special, Ray's Paddock and tagged fasig-tipton, fasig-tipton saratoga, liam's map, PR special, rushing fall, Saratoga Stakes, Thoroughbred Auctions, thoroughbred sales by Paulick Report Staff. Bookmark the permalink.